LIAM FONTAINE has unfinished business. 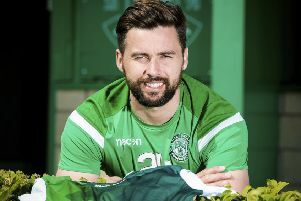 Signing a new two-year deal at Hibernian, the influential centre-half said that, having come so close to taking the Leith side back to the Scottish Premiership in his first season at the club, he wanted to see that job through. “I had a couple of other options. That was always going to be the case. But, in my heart of hearts, I always wanted to come back here and continue what we started. “When you do anything in your life, you set a goal you want to achieve and I’d like to do that in my time here. I think we have to be confident. The 29 year old, who joined the Leith club last summer on a 12-month deal, made 38 appearances in an impressive debut season and has been rewarded with an extended deal. “It was definitely enjoyable. I had a great time here last year and I really loved being part of it. I loved the support we received and the support I received personally. It was enjoyable to be aiming for something. It’s what I play games for and I want to achieve things. The summer break was a relatively short one, but Stubbs says he used the time to ponder the events of last term and plot improvements ahead of the new campaign, content in the knowledge that his side, he says, was not far from where it needed to be. “I had a really good break and it was a chance to reflect on last season. I’m really looking forward to the new season. We were obviously disappointed to lose to Rangers in the play-offs because we felt we were close, but, ultimately, not close enough. But the near misses of the last campaign will be the motivation for everyone at Easter Road as they head into the new season and this time they are determined to make a brighter start and set the pace for those who want to challenge them. Last season’s campaign got off to a stuttering start and came to a shuddering halt when Hibs suffered a Scottish Cup semi-final defeat at the hands of Falkirk and then lost to Rangers in the semi-final of the promotion play-offs. The league will be the primary focus again, with cup runs and the hope of silverware an added bonus. Rangers, of course, have breathed fresh life into the side with the appointment of management team Mark Warburton and Davie Weir. But, while Fontaine is buoyed by his own manager’s transfer manoeuvrings, he believes it is Stubbs’ personal influence, allied to the stability and continuity in the playing personnel – particularly if they can retain the services of Scott Allan – that could prove their biggest assets and render them a force to be reckoned with. “The gaffer’s way is contagious for me. He played in my position, so just being able to speak to him about things and his experiences and what he’s learned and the strikers he played against is great. “The vibe we have at the training ground and the interaction between everyone is really good. It just works. And, for me, that’s why I enjoy myself and I’m happy. “I spoke to the gaffer at the end of the season and he told me of his intentions and we have been speaking to each other throughout the summer. “It’s all positive, and I wanted to be a part of that. I think he’s a great guy and a great manager and the feeling amongst everyone here is great. “Rangers have always been a big club and always been able to bring in players because they have that big a support. “But we’ve shown last season that it’s all about the group, if you can bond and gel together, whichwe did that last season.